Easy to use machine to increase efficiency and productivity for the light manufacturing and fabrication users. Color screen featuring Auto-Set™ Elite and Pulsed MIG. This all-in-one welder connects to 208 or 240 volt input power. Welds up to 1/2” aluminum. 7-inch color LCD display ensures proper machine setup and parameter selection, reducing setup time and increasing weld time. Lower heat input for less distortion on thin materials, less spatter minimizes post weld grinding and rework allowing more welding time. Perform welding applications that couldn’t be done in the past. offers predefined weld settings to increase ease of use and ensure that the job is done right for operators of all skill levels. Deliver more productivity, consistent quality by welders of all skill levels by using prequalified weld settings. Minimize supervisor need to intervene. For portability and reliability this inverter power supply allows for any single-phase input voltage hookup (208–240 V) with no manual linking, providing convenience in any job setting. Ideal solution for dirty or unreliable power. Capabilities include MIG, pulsed MIG and flux-cored welding. AccuLock liner loads from the front and locks at the front and back to insure proper alignment for flawless wire feed path. New rubber overmold and ball -and-socket handle design improves grip and reduces welder fatigue. New Industrial Bernard AccuLock™ S contact tips provide superior Spray and Pulsed MIG arc performance. Portability - Machine only weighs 84 lb. Weight is reduced by more than 50 percent compared to the Millermatic 252. Operators no longer need to use lift truck to load machine and running gear into the truck. Latches secure machine to running gear. Simply loosen the latch retaining knob and rotate latches to disengage machine from running gear for easy portability. EZ-Latch™ design, latches machine to running gear to easily move machine and gas cylinder around work cell or simply rotate latches to disengage machine from running gear for easy portability. Eliminates the need to use lift-truck to load machine into a vehicle to get to remote site. Most economical and reliable spool gun in its class! Designed specifically for home hobbyists & light fabricators. Rated at 160 amps at 60% duty cycle - ideal for welding with .023 - .035 wires. Perfect for use with the Millermatic® 212 Auto-Set™. Ready to MIG weld with your new Millermatic® 255 or Multimatic® 255 welder? Follow these steps to get started. Learn how to set up your new Millermatic® 255 and Multimatic® 255 to weld with the self-shielded flux-cored process. Millermatic 255 and Multimatic 255: Think Simply. Weld Smarter. 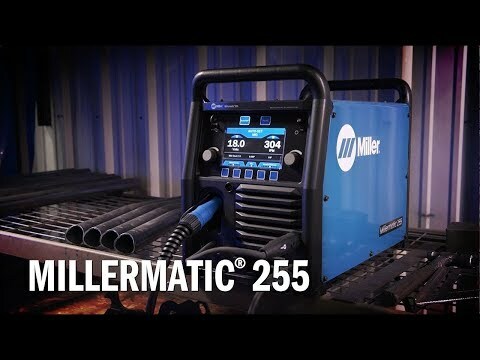 Reduce downtime and increase productivity with the Millermatic® 255 MIG welder and Multimatic® 255 multiprocess welder.